When wired connections fail, organizations need business continuity solutions that keep machines and processes connected, branches linked and transactions flowing. 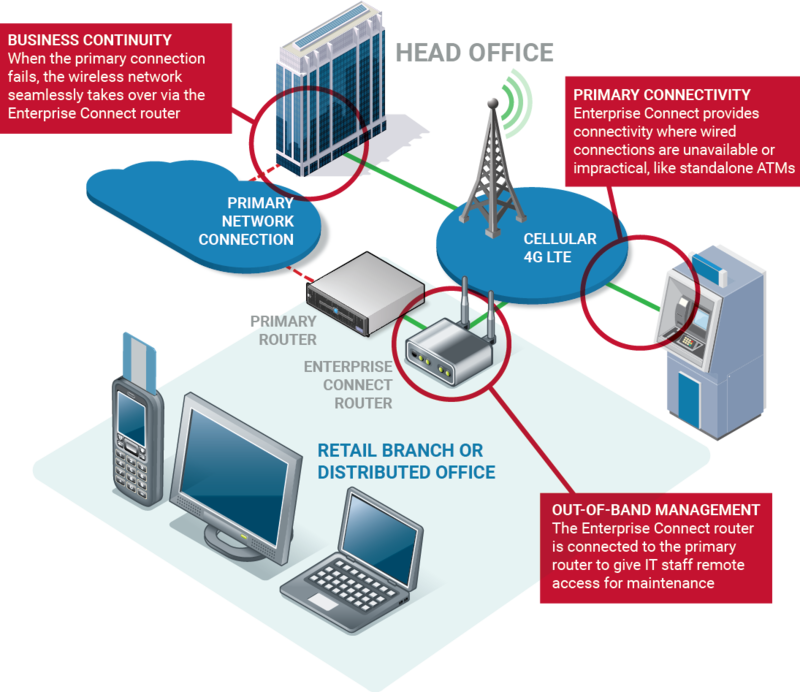 ORBCOMM Enterprise Connect is a wireless failover solution for distributed and retail enterprises that need to protect their WAN from loss or disruptions and prevent lost revenue/productivity. Have confidence in the quality of hardware offered by industry-leading router and accessory manufacturers including Cisco, Cradlepoint, Encore, NetComm, Systech and more for a custom solution that fits your business needs. Dependable network connectivity is a must. Enterprise Connect offers highly reliable connectivity from tier-one network providers Verizon and T-Mobile. Enterprise Connect provides high-performance subscriber management and service delivery, seamlessly facilitating provisioning, billing and multimode access for M2M applications. Plus, monitor router statistics and data usage in real time, wirelessly manage firmware updates, configure hardware, produce reports and set alerts to avoid overage charges. Allows IT to remotely troubleshoot, configure, reboot firewalls/routers/bridges/switches/servers without downtime costs and dispatching a technician to diagnose, repair and/or replace equipment.